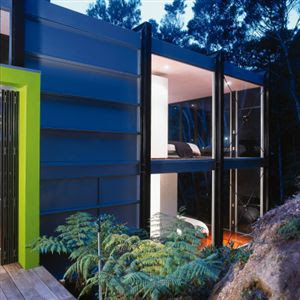 Mentioned a couple of posts back, here's a really nice dark wood covered house in the northern bush of New Zealand. Apologies for the small images. 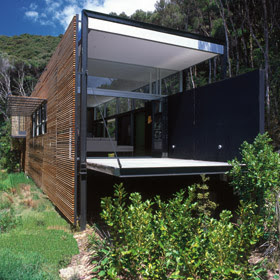 Andre has created a chic bachelors pad in the bush, overlooking the Bay of Islands, at the warmer end of New Zealand. Barely enough room has been cleared from this Tee Tree covered area for the house. 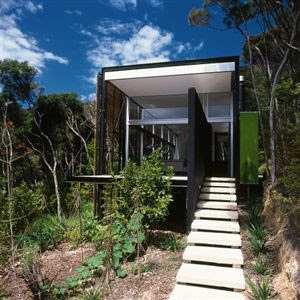 The simlpe rectangular layout is divided into deck, living, dining, kitchen, then up or down to a bedroom at the far end (I will try and get a plan up soon). 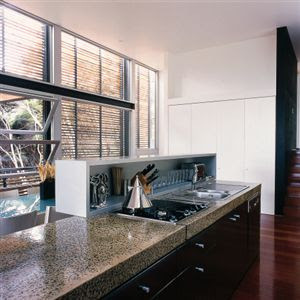 The front and rear of the house are stripped by wood with shutters that open up to let light in for the kitchen. 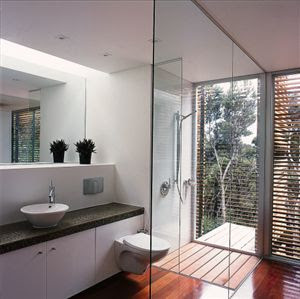 Larger garage door size shutters fold up to let light into the living room, and a vertical door folds out for outdoor bathing. 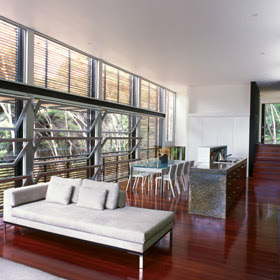 The ends of the rectangle have large decks, for both the living and each of the bedrooms. 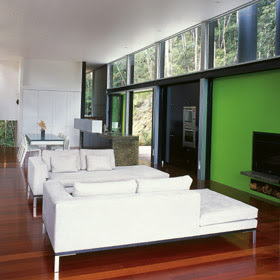 That bright green wall houses the fireplace and passage out to the deck and clearing at the rear of the house, where the entertaining takes place in summer.